Triage is the process of prioritizing care in a resource constrained environment. The French first developed this technique on the battlefield when medics were overwhelmed and couldn’t provide sufficient help to every soldier who needed it. Triage separates the wounded into three groups: those who can be saved with immediate attention, those who are stable enough to be left for care at a later time, and those who are too far gone to be saved at all. This same process is beginning to play out in our failing communities. First, let’s look at the suburban development pattern. Municipal governments anticipate rapid growth so they preemptively built infrastructure out on the edge of town to accommodate more of everything. This is very often done as a way of inducing growth before market demand is evident. 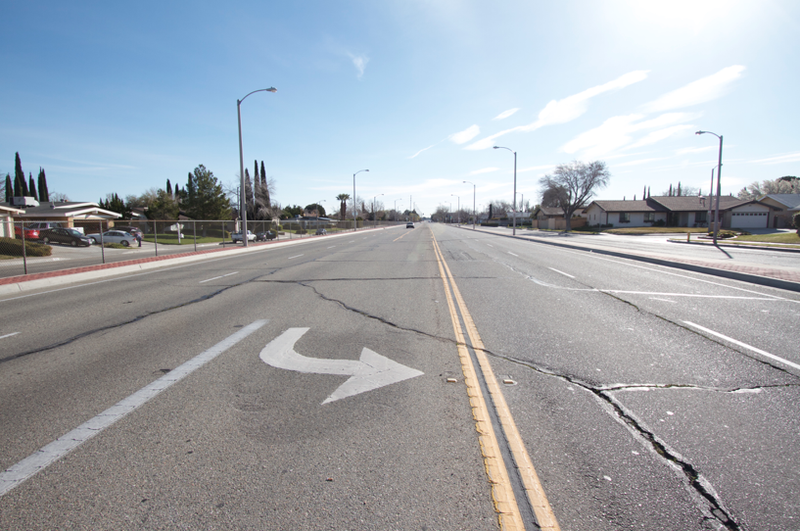 So long as growth actually occurs the town’s investment seems prudent and orderly. It’s easier to build massive roads before the landscape is cluttered with buildings and already heavily used by motorists. Unfortunately, the road infrastructure pictured above was put in place twenty five years ago and the town is still waiting for someone to flesh out the adjacent vacant land. 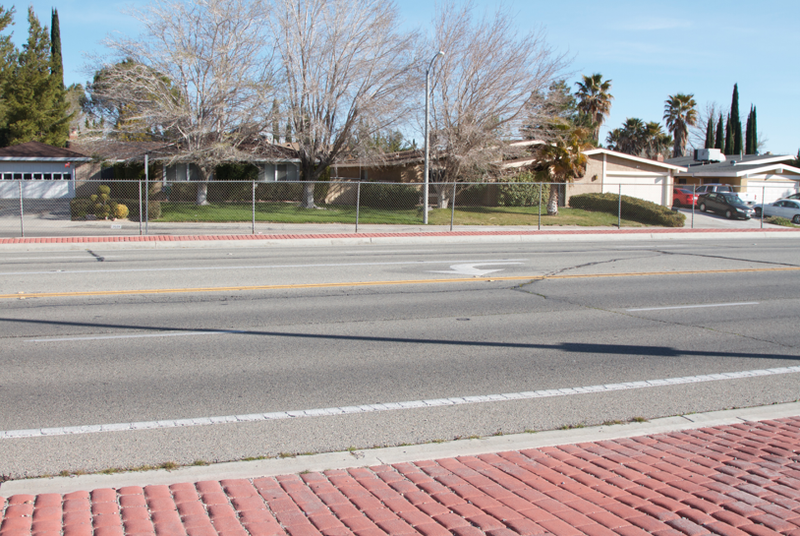 It’s entirely possible that this stretch of road will deteriorate and need to be repaved long before the desired shopping malls, office parks, and residential subdivisions appear. The traffic lights and turn signals alone cost $350,000. 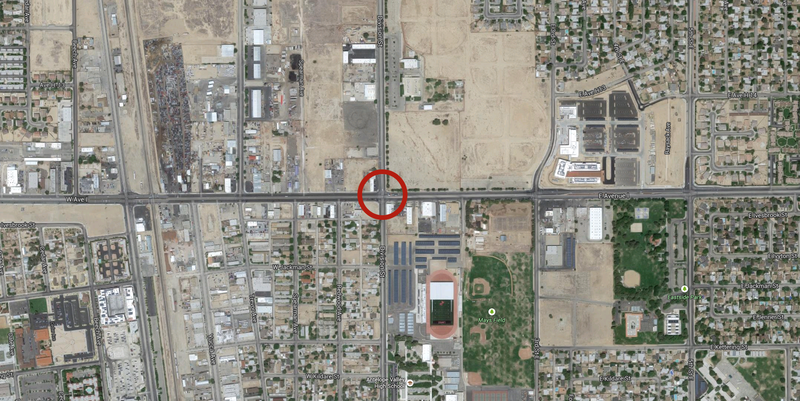 This ten lane road intersects an eight lane road. That kind of paving costs millions of dollars. That’s a huge sunk cost that was never actually needed and has drained away precious revenue from more important public works for an entire generation. 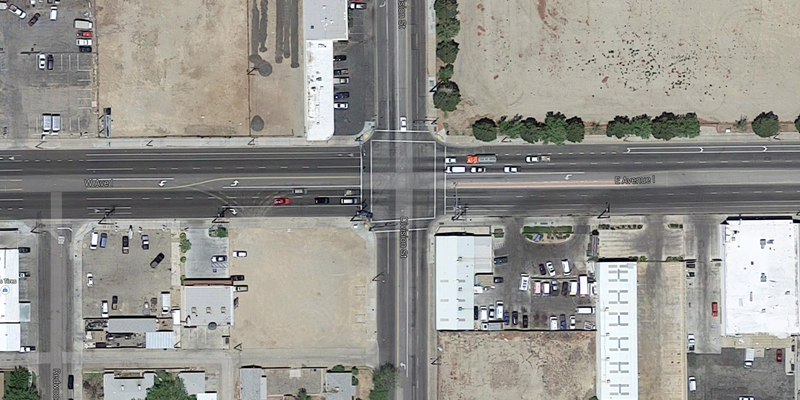 Here’s a more modest intersection where a six lane road crosses a four lane road. The lights and signals here probably cost $250,000. But look at the sparse level of development it serves. Half the land is vacant. The rest is composed of a few industrial sheds, some tract homes, and a scrap yard. 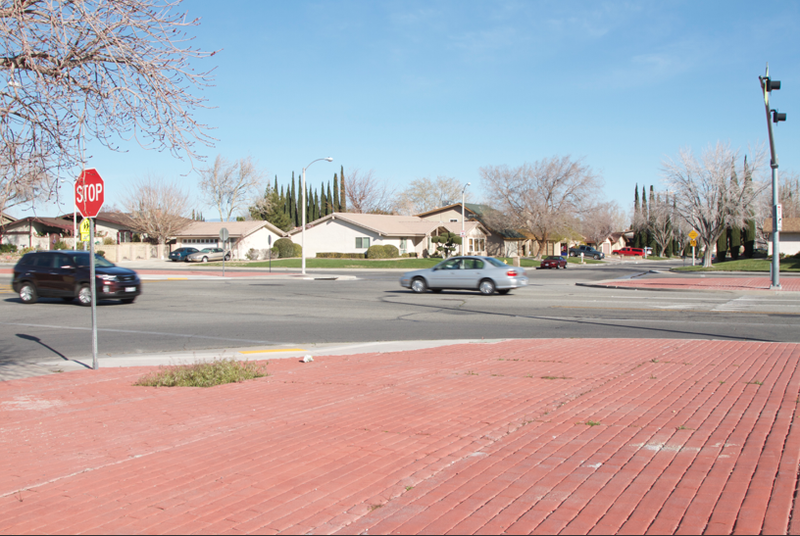 Here’s an intersection that was constructed in the 1960’s in a part of town that is fully built out. This is the best case scenario in terms of the suburban land use plan. All the nearby territory has been covered in respectable single family homes with tidy front lawns and backyard swimming pools just as desired. But look at the amount of pavement relative to the built environment. There’s a huge amount of road serving some pretty modest structures. 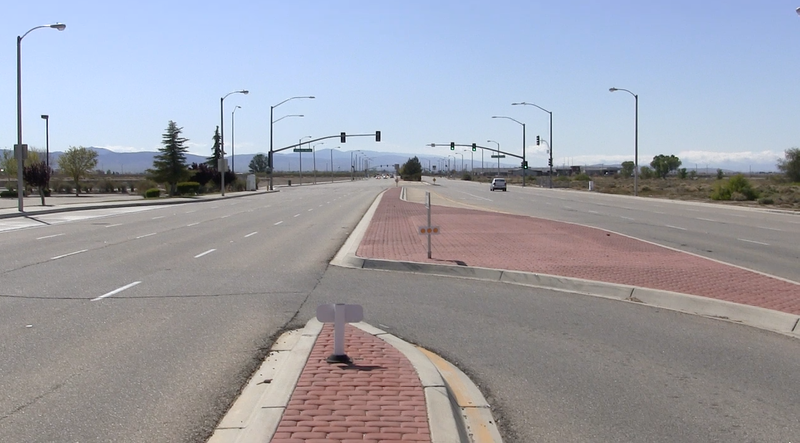 Also notice that there’s so much roadway that the area is a safety hazard for pedestrians – or as the traffic engineers might say, the occasional pedestrian or cyclist poses a grave threat to motorists. 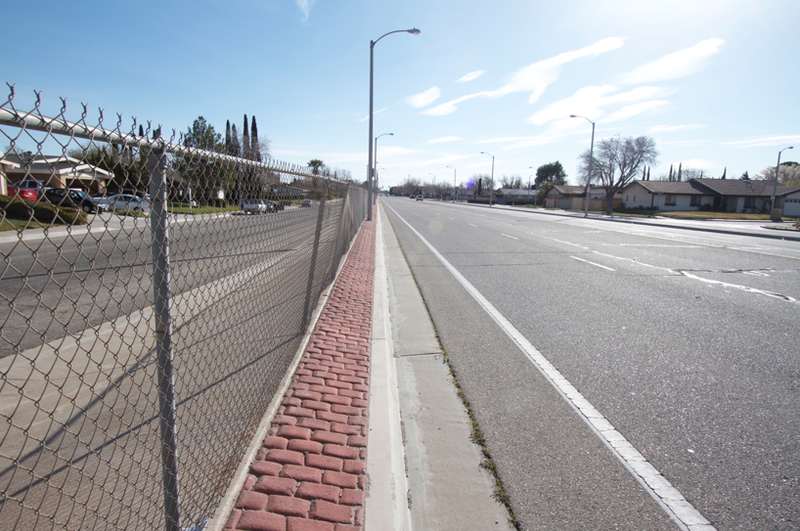 The chain link fence ensures that no one is ever tempted to try and cross the street on foot. In a part of the world that is dedicated to raising children and allowing people to age in place it’s actually a pretty sucky environment once you wander out of the cul-de-sac. We all know what happens to our homes as they age. The roof needs to be replaced, the water heater dies, the dish washer eventually fails, and so on. The same is true of municipal infrastructure. The question in this case is how to pay for the upkeep on these massively overbuilt roads and underlying pipes and cables as they deteriorate. The gasoline tax and Department of Transportation trust funds all over the country are already in the red. The states and feds are deep in debt. If you think the nice folks living in these neighborhoods are going to accept big tax hikes to repave these roads you’re sadly mistaken. Floating yet another municipal bond is going to be expensive when the banks and investors see how pathetic your town’s cash flow is. Here’s the scale of the problem. 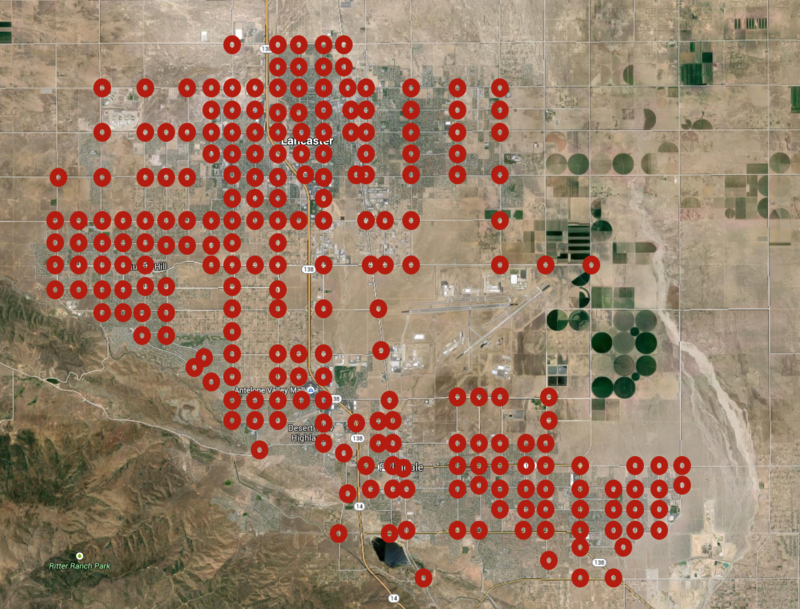 Each red circle is an intersection that needs to be maintained at a price point that isn’t even remotely going to be covered by the local tax base. Now connect all those red rots with the connecting infrastructure… The numbers simply don’t add up and they never will. The growth phase of this area has come to an end and the maintenance bills are starting to arrive. That takes us back to triage. With scarce resources people need to start asking some tough questions. What gets maintained and what is let go? I recently spoke to a group of civil engineers and local government representatives. The engineers all looked around and very quickly drew lines on the map. The older parts of town closer to the center were already pretty viable as they were. The newest developments on the edge of town were toast from a cost/benefit perspective and should have never been built in the first place. The stuff in the middle was a toss up. With a little work some of it could be salvaged and some of it will probably fail. Then there were the government folks who deal directly with the public. They looked at the map and explained that the wealthier most politically organized folks live out in the big new homes on the edge of town. The people who live in the older more central neighborhoods are predominantly poorer less educated ethnic minorities. Anyone want to guess how scarce resources are going to be spent moving forward? Triage una estrategia que separa los casos que deben atacarse de inmediato, los que pueden mantenerse hasta que haya tiempo de atenderlos y los casos perdidos, más allá de cualquier arreglo. I think that an issue we have is space. 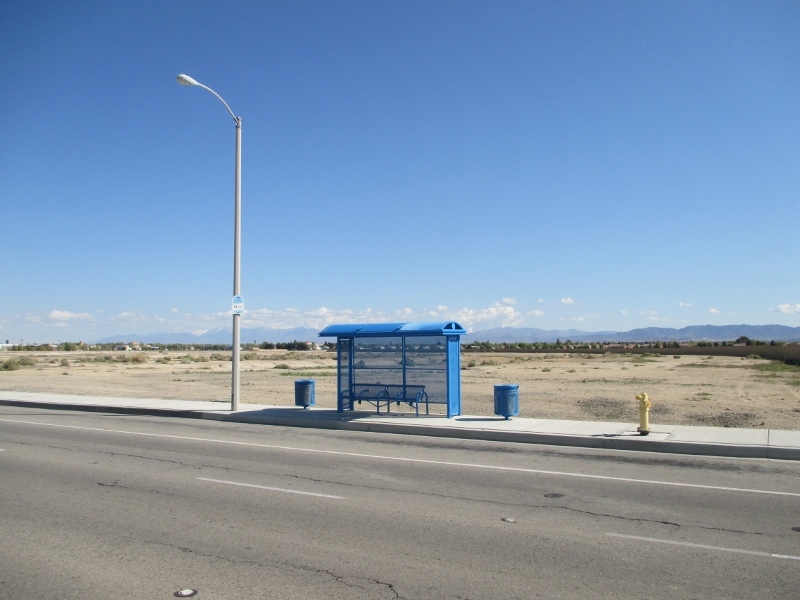 We have so much land in the Antelope Valley that it’s much easier to say.. “build outward” than it is to convince anyone to revitalize existing infrastructure. Considering there are plans in place to continue this process with additional big box retailers further from the city center it will only increase the problems. Neither city here is any better either, they both love sprawl and are addicted to the quick money from big box retail.. all the while the mom-and-pop businesses are closing one after the other leaving the city core empty and heartless. Adam, Having an endless amount of cheap land does encourage endless growth. But there are other constraints. Water? Fuel? Easy access to zero interest credit? These things will not last forever. Downtown Lancaster near the Metrolink station and some of the adjacent neighborhoods have a fair chance of surviving the next century. Just about everything else is probably toast in the long haul. “Mom and pop” will be the savior of the local economy when the last Big Box covers its doors with plywood a generation or two from now. The AV will be a lot smaller, but probably better once the dust settles. One cannot forget about the political side of this issue. Ooooh. That explains why we have a better dynamic where I live. With population decline in the Rust Belt, the remaining rich people living in upstate NY. have decisively moved closer to town, where they can buy “heritage” 100-year-old buildings, fix them up, and have private mansions. Heck, in most cities around here you can even buy a 100-year-old *church* for your private home, which is pretty grandiose. Actually, there are enough burned-out lots that rich people who want new mansions can clear an entire block for a really serious mansion, too. This means that the richest people are *not* living on the outskirts of town. The dynamic changes. Eric, I don’t see the situation as depressing. It’s just how things are at the moment. But things change. They always do. Remember the Rodney King riots in 1992? Some of the hardest hit neighborhoods in South Central LA – areas that were completely written off by the middle class as unsalvageable – are currently the most rapidly gentrifying. No one saw that coming twenty years ago. The pendulum swings… The clever thing to do is understand the underlying forces at work and use them to your advantage. 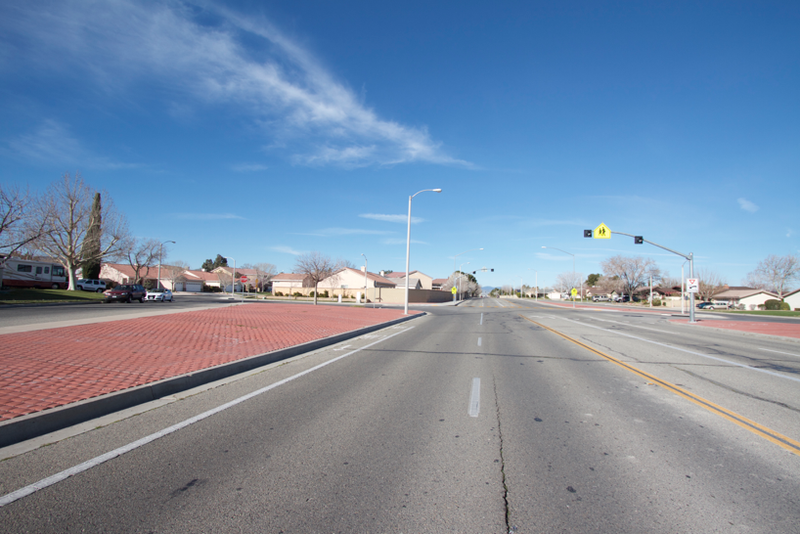 In my opinion the Antelope Valley is going to decline economically and contract physically. I don’t think there’s anything that can be done to stop that process in the short term. However, once things bottom out in about twenty or thirty years the new smaller more manageable bits that survive may come back stronger. Time will tell.